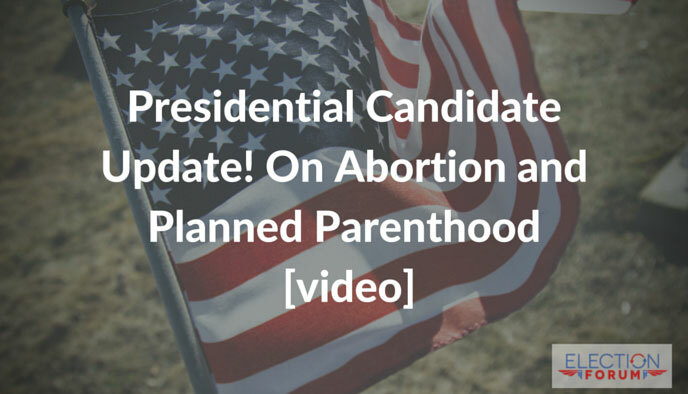 Here is a brief update on what some Presidential candidates are doing and saying about abortion. In Wisconsin, Gov. Scott Walker says he supports a bill currently in the legislature that would cut off some grant funding to Planned Parenthood. He has already signed one bill to cut some Planned Parenthood funding and has advocated that abortion be defunded throughout the nation state by state. He has also signed into law a bill for Wisconsin that bans abortions after 20 weeks. Sen. Ted Cruz has launched a new de-fund Planned Parenthood campaign: calling on pastors to get involved and speak out. He’s hosting a nationwide conference call with pastors to discuss how they can use this influence to stop taxpayer funding of Planned Parenthood. In early August, Gov. Jindal and Louisiana’s health department cut off state Medicaid funds to Planned Parenthood, giving 30 days notice. Now, Planned Parenthood is suing Louisiana over it. During the first GOP debate, Sen. Marco Rubio gave an excellent defense of his firm pro-life stance. At a rally in Ohio, Sen. Rubio called on Congress to de-fund Planned Parenthood. He suggested that we take the money and distribute it to health centers that are actually providing women with health care without committing the “atrocious activities” revealed in the Planned Parenthood videos. He also points out in a letter that Planned Parenthood dehumanizes not only the unborn but women as well. Note: If you didn’t see his amazing debate on CNN, see here.